Who would've thought that the Twitter scourge would actually make its way to the unborn in the form of Kickbee? 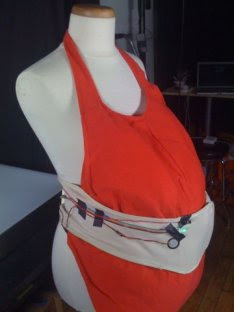 This strapped-on set of piezo sensors are able to monitor the baby, sending wireless updates to Twitter so that expectant parents are able to show off to the rest of the world how their little unborn child is doing. Apparently, the Kickbee feature an Arduino that supposedly interprets the input while transmitting them using Bluetooth to a nearby computer that will eventually send out Twitter updates. The sensors are currently very sensitive at this point in time, although it is being worked on. Guess there is no privacy these days, not even when you're in the womb, eh?